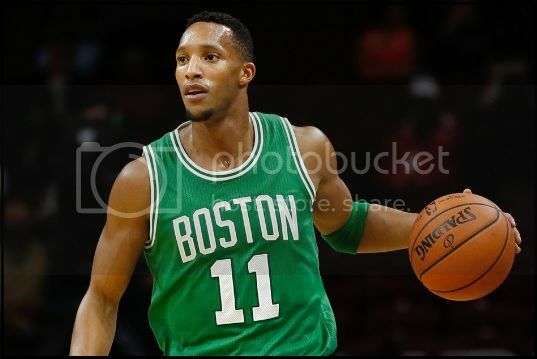 The Portland Trail Blazers have signed free agent forward/guard Evan Turner, and he was introduced by the team at a press conference on June 7. As reported, the deal with Turner worth $70 million over four years, or an average of $17.5 million per year, though it is likely to be structured somewhat differently. Turner agreed to terms with the Blazers on July 1, the first day of the free agency moratorium. Free agency began at 9:01 p.m. (PT) on June 30. Free agents could not officially sign their new contracts until the free agent moratorium ends at 9:01 p.m. July 6. Turner, 6'7", will be entering his seventh NBA season, the past two having been spent with the Boston Celtics. He played his first three-and-a-half seasons with the Philadelphia 76ers before being traded mid season to the Indiana Pacers during 2013-14. He Joined the Celtics the following off season. In 81 games last season with the Boston Celtics, Turner averaged 10.5 points, 4.9 rebounds, 4.4 assists and 1.0 steals per game. He shot 45.6 percent from the field, 24.1 from the three-point line and 82.7 percent from the free throw line. He is known as a solid defender who possesses a strong mid-range offensive game. After Turner agreed with the Blazers, the team was widely rumored to be going after Chicago Bulls center/forward Pau Gasol, who has won two championships as a member of the Los Angeles Lakers. Gasol since signed with the San Antonio Spurs. As early at 9:45 p.m. on June 30, The Vertical reported that a Blazers contingent of president of basketball operations Neil Olshey, head coach Terry Stotts, owner Paul Allen and guard Damian Lillard were meeting in Los Angeles with Dallas Mavericks' forward Chandler Parsons. Speculation was that if they landed Parsons, they could use him and his friendship with Houston Rockets center Dwight Howard to lure him to the Blazes as well. Parsons chose to sign with the Memphis Grizzlies and that Howard with the Atlanta Hawks. This is the year... Go Ducks,Blazers and Timbers, lets go back to back! I think it's an OK pick up but I think the Blazers should focus more on the front line bigger, more agile. I love Mason Plumlee work ethic and hustle but not the best defender. It is said they are looking at Pau Gasol. I believe Hibbert is a free agent now. He probably could be picked up at this point as a bargain. Hibbert would be a good choice. He's not the force that people thought he would become, but for what the Blazers would ask him to do, I think he could be up to it. Call me optimistic but I think he will serve to improve those around him. Just because he is good at handling the ball doesn't mean he needs to take it away from Cj or dame. I just hope his 3% improves. That's what take it from a decent to good fa signing. i wonder if he is a consolation prize. things looked to be going a different way, then we got this news. Evan can play; there's no question about it. i just wonder about this signing from a position standpoint. it makes me wonder if Neil Olshey anticipates not being able to sign Allan Crabbe. I had mentioned to a couple friends few weeks back that I thought Gasol would end up here in Portland. Three blazers had a shot at Hibbert i think a few years back, didn't happen though. I think the team is close to the next level, Golden state barely for by us, which showed our experience, just young. .. we are close! Nice call on Gasol ...if it happens! The Blazers offered Hibbert a contract five years ago. The Pacers matched, then signed Batum for about the same amount. Even with the numbers being thrown around, Hibbert could be a bargain. Great to see you guys here. Please keep coming around! i still have a question mark about this signing. i don't know that Turner is better than Henderson, who we probably will not be able to sign now. i want to see what happens regarding trades and future free agency. I believe Turner is listed as a small forward, but i would choose Henderson tip play back up to C.J. Turner might add inside and outside though ast the small, which could open three floor up even more for Dame and C.J. I am really excited about Harkless, we will be good! I'm wondering what might happen with a trade. I heard They are trading for Shabazz Napier from Orlando. I think it's just for cash. i still would like to see Connaughton get a shot. he's only on a two-year contract so if he doesn't play, i wouldn't be surprised to see him go back to baseball.